Wanted to share my good buddy's story that happened over memorial day weekend while we were diving Big Sur. We were cleaning fish on day 2 and he lazily threw a carcass at which point the dorsal spine came around and pricked him in the arm. Not bad at all, small pin prick with about 1 second of bleeding. Wiped it down with Neosporin (I can't recall if he used soap first - I think he did). It was just a small bump with redness, like you'd expect. By day 3 he developed small blisters and rash on his forearm, stomach, leg, neck and face. He went to urgent care. 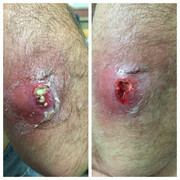 They gave him the wrong mix of antibiotics and tetanus shot which caused an even worse reaction by day 4 and 5 (see pictures). He went to ER and they pumped him full of stuff: Steroid shot, antihistamine, steroid pill, etc. It appears to be contained and going away finally after a week. Just a reminder to play it extra safe and do everything you can to make sure wounds are cleaned when dealing with ocean bacteria. Several people have commented the same thing. I would tend to agree, however, both different doctors considered it and ruled it out. "It was an allergic reaction to the bacteria which caused a similar classification of poison oak but not how I got it. Because of my allergic reaction to the fish bacteria, I was able to get in antibiotics before the infection set in." I wonder the same thing, I've had a lingcod tooth in my finger for over a year and a urchin spine in my elbow for 6 weeks now with no problems. I would guess that if an infection would have happened it would have been right away, someone tell me if I'm wrong! Perhaps the body will reject it years down the road such as this fellow with glass in his elbow. It's definitely poison oak, but "Fish Spine Infection" is cooler sounding....and a better album name. I ain't arguin' - just wonder what it was that got the docs thinking differently. I did find one abstract though with some good info. The quillback and the brown are the only rockfish with toxin in al of their dorsal spines. And they both have a high ratio ofof toxin glands to spine length. Here's the chart that told me what I already know. Browns and quillback pokes are the WORST." No worries then. Never came across any of the poison oak species while diving . I have received a light poke from a black and lost all feeling in my thumb for about 5 months. So hope I never get poked by anything on that list. You can get all sorts of nasty bacterial infections from ocean life. My buddy’s dad was sick with a microbactarium he contracred from cleaning fish and lasted for many months. Gotta be cautious with open wounds and keep em clean. Ha but that really does look like a poison oak rash.